Speed up Your Business with High-Performance IT Infrastructure. Just a simple adjustment to your IT infrastructure can make huge differences in your business productivity and revenue if you know the key requirements to high performance IT system. We are here to help you – Take control of your IT costs, improve system security and become more responsive to the marketplace with the help of our experienced experts. Just a simple adjustment to your IT infrastructure can make huge differences in your business productivity and revenue if you know the key requirements to high-performance IT system. We are here to help you – Take control of your IT costs, improve system security and become more responsive to the marketplace with the help of our experienced experts. Vision and scope document explaining your business needs and its scope and conceptual architecture. Proof of concept documentation and configuration to validate the solution being offered. Full scale architecture and design for all solution components. Risk assessment and analysis of the whole project. Production server pilot phase participation for a pilot group of upto 10 users. Business continuity and disaster recovery plan. High level of security including avoiding spam, hacking and viruses. High service availability to meet the growing demands of your business. 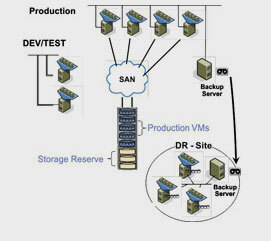 Backup and disaster recovery solution to survive in any circumstance. Storage reliability in case of failure or power outages. Unified messaging across your company operations. Best practices for multiforest and domain Active Directory that make it easier to manage and operate.